^ I'm guessing the price in the U.S. for a '16 RDX AWD with Advance Pkg will be close to US$45K, with the price in Canada for the same vehicle (with equivalent Elite Pkg) being around CA$49K. I suppose we'll learn about exact pricing by around the end of April. As an aside.. I've just discovered that the '13-'15 RDX is equipped with a "prop rod" for the hood rather a hydraulic strut arrangement. What's up with that on a luxury-branded vehicle? The non-luxury branded '13-'15 Hyundai SF Sport is equipped with twin hydraulic struts for its hood. This item isn't a biggie of course, but it is surprising for the Acura RDX. I see the MDX has a strut arrangement for its hood. Don't like that? How about this? The RDX is so uninspiring under the hood that you won't want to show it off. The reality is that the average RDX owner will seldom (if ever) open the hood, so the cost savings here (the gas filled struts, attachment points on the hood, possible redesign for pedestrian safety or crumple zones etc.) probably make sense. "On April 16th, the new RDX arrives in dealerships. But, because you're on the list, we're sending you this exclusive first look at the new RDX. So mark your calendar and stay tuned for updates because it'll be here before you know it. 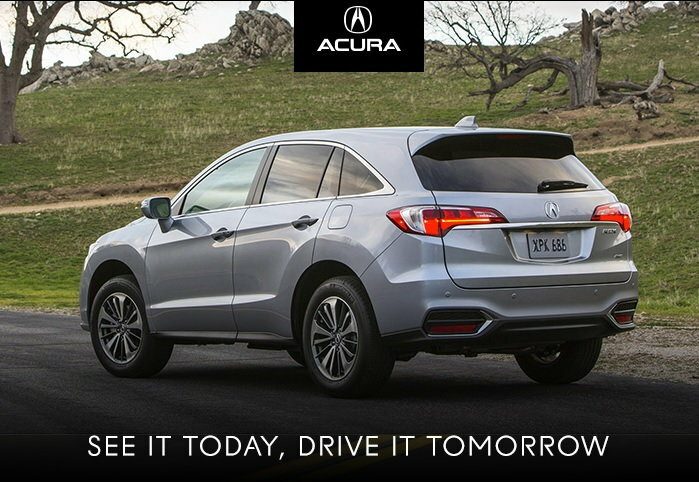 One of the biggest updates for 2016 is the available RDX AcuraWatch™ suite of advanced safety and driver-assistive technology including Adaptive Cruise Control, Lane Departure Warning, Lane Keeping Assist System and Collision Mitigation Braking System™. April 16th is coming. So is the new 2016 RDX. Get ready." Last edited by kfhughes; 03-18-2015 at 02:13 PM. Anyone knows if they will add an espresso leather color for the interiors? Just watched them all, could have been more in depth, but it was good, I wish they had one showing the use of paddle shifters in D and S modes to see how to it works and how fast shifting via paddles is. If someone stole our RDX paddle shifters, I wouldn't notice for a l-o-n-g time. According to Honda's press release today the 2016 Honda Pilot will have several new available features that the updated premium branded 2016 Acura RDX will lack. ^ I don't really subscribe to that logic for comparison - it's outdated IMO. Many same-segment competitor vehicles to the RDX offer the majority of those features, including the Lexus NX and Lincoln MKC. Acura is being excessively frugal and out of step in this regard. No Honda-branded product should out-do a premium-branded Acura product on the available features list to such an extent, especially in this hot small luxury SUV segment. Last edited by rbreeze; 04-10-2015 at 12:36 PM. Dang...I don't care about any of those except the flexibility of the power outlet. Surprised about the roof rails, though...are they really not available? A giant moonroof and huge wheels don't speak 'luxury' to me...it's the kind of stuff you see on a MINI. Roof rails not available from the factory on the RDX, but available as a pricey ($650) dealer-installed accessory. I like a Panoramic roof - it provides a more airy feeling /brighter ambiance to the interior and speaks luxury to me. 20 inch wheels appear overly large to me on most vehicles, but 19 inch wheels are just right IMO. The largest wheels available on the '16 RDX will be 18 inch, and to me they appear small on the vehicle. Acura should have made 19 inch wheels an available factory option on the '16 RDX. No doubt Acura will address all of these items on the totally redesigned 2018 RDX. Acura always seem to follow the same pattern - make people wait for certain features that competitor vehicles in the same segment already have available. And what price do you pay for the NX or MKC to get all those features ..more than the RDX. The RDX is being built to a price point and focuses on performance vs all out toys but still keeping the price fairly reasonable. I'm guessing the new pricing on the RDX won't be far off the Lexus NX or Lincoln MKC. I will be interested to see since it will be missing a few features (heated rear seats, heated steering wheel). I've heard that argument before (many times) from Acura brand defenders, that the cars are built to a price point. I guess that's why there haven't been rear seat HVAC vents in the RDX prior to m-y 2016. This on a vehicle that participates in the luxury segment. But the vents are finally showing up for 2016. Hey, what's happening here? What about that price point thing? (perhaps 'profit point' is more to the point here). The thing that's maddening is that Acura eventually adds stuff (or makes it optionally available) but typically makes buyers wait at least 2-3 years longer than they should for features that customers want NOW. Anyway, we'll see what the much-better-equipped '16 RDX Advance comes in at for price and how it compares to same-segment competitor vehicles such as NX, MKC and others. As for me.. I want what I want and I'm willing to pay extra for the extras. I don't normally even bother with the rims, but this one sure looks odd. It looks like the pricing for 2016 models has released. Waiting for that updated website Pricing is def. fair though...Tech with Acura watch will be popular I'm sure. 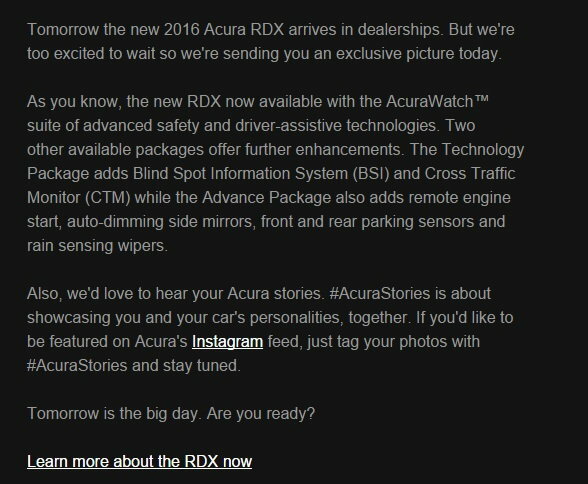 Why info not coming from Acura website first, but from other sources? I have kids and I'm looking to buy a crossover for my wife. I didn't know whether to get a Lexus NX or the 2016 RDX and eventually I decided for for the RDX to get better cargo and larger 2nd row. I wanted to buy a white RDX with espresso brown but Acura doesn't offer this combo. Ok, let's give up on espresso and get black interiors. Wait. What? Acusa offers only parchment on white body? And you call Acura a luxury brand? Good question...you would think they had the new site prepped and ready to roll out the day it was supposed to hit dealers...doesn't make much sense. Pricing is out there too for download but I don't have a journalist's account. 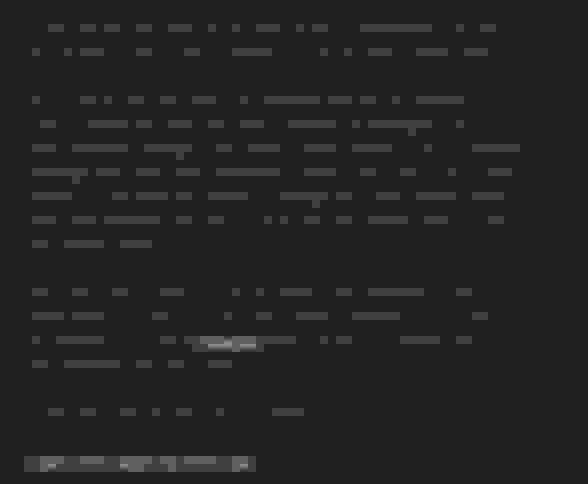 Last edited by blacktsxwagon; 04-15-2015 at 10:49 AM. Wow! RDX fwd with Advanced under $42K. That seems pretty strong valuewise. Looking forward to seeing it in person. As it is not sh-awd, I guess many will jump to FWD with Advanced package. Seem a bit lower than I expected, price-wise. Yeah, that is what I am thinking (in 3 years when the prices come down haha). Unless they have made some drastic improvements to the AWD performance it does not seem to provide that much benefit. The on sale date is tomorrow the 16th so website "should" be updated then. Does anybody know when we can expect packages, pricing, and on sale date info in Canada? Okay... I guess color of the seats are more important then space. Not to mention price. Personally I think Parchment looks very nice and luxurious versus Black. I have a black interior and wife has parchment. But I guess that is a moot point. Enjoy the Lexus! ^^ I agree that rejecting a brand as luxury because of seat color is a bit harsh but that being said, Lexus ain't bad either...It's my 1st one and I like it thus far. I was really mad when I read the 2016 specs and I still ca't believe that. I'm so mad because I like the RDX so much! Don't get me wrong but I'm willing to spend $40k or more on a car and I can't get the color combo I want? Any luxury brand offer at least 3 interior colors for any car on their line up. We want white body and dark interior, and simply Acura doesn't offer that. Yes, Tan (parchment) is beautiful but not when you have little kids, believe me. Also don't try to wear jeans on tan leather if you don't want blue stains on the seat edges. And for cargo, yes there's more room on the RDX but I can live with something smaller I guess. However I will go and check the car as soon as it gets to the dealership. Maybe my wife will like a different body color. I think this depends a lot on the brand of jeans you wear. Some jeans transfer dye much more freely. My 8+ year old TSX has never had dye transfer from my jeans. I've also found the Woolite/water mixture is the best thing for cleaning the leather in my car. Our last car (an '09 Cadillac CTS) had a light gray leather interior and color/dye transfer was a problem with virtually any brand of dark blue or black jeans we wore. The problem also occurred with dark leather jackets/coats. You read about color transfer problems involving light colored leather interiors in virtually every automotive forum one visits. Because of this issue we will never again buy a car with a light colored leather interior. Our current vehicle has a black leather interior - no worries. White Diamond RDX's built for the Canadian market are available with two interior color choices - Ebony leather and Parchment leather. I don't understand why Acura USA limits the buyer to only Parchment leather when ordering White Diamond. There's something very wrong with that limitation. Actually, I'm having difficulty understanding /agreeing with many things that Acura do, but that's a whole other discussion. Last edited by rbreeze; 04-16-2015 at 06:54 AM. I agree that black leather interior should be available through out. But sadly it is not. However, I don't consider it a deal breaker considering how much of a great value the RDX Advanced is overall. As for Parchment, yes it can transfer stains like any other lighter color. But as with any leather seats (regardless of color) routine cleaning and conditioning will keep them looking good. Last edited by CybrRdr; 04-16-2015 at 08:50 AM. The 2016 RDX configurator and pricing is now live on the acura.com website. Still isn't up on the Canadian site. Called all the Houston dealerships and they don't even know the 2016 model exists. Only looks like half the site is updated. It has info on the 2016, but all the configurations are still 2015. I guess that doesn't matter if the other pricing we've seen is right. The adaptive cruise control on the '16 RDX seems to be the only one among Acuras that doesn't mention low-speed follow (on website, RDX > Features > Compare Models). Can anyone find information to the contrary? It also doesn't have the road departure mitigation feature that the other Acuras have. I'm surprised that Acura would give the RDX a poorer AcuraWatch package than even the ILX!